Web hosting lets anyone using your domain name (or URL) view your website over the Internet and gives you domain email addresses, email forms, secure pages and many other features. What is is web hosting? 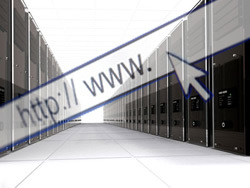 You may already have a domain name but to get a website online, you need web hosting. We also provide associated domain email accounts so you can send and receive emails using your website name and ditch those generic hotmail or yahoo email accounts. Web hosting provides a powerful computer (the web server) connected to the Internet so web users can view your website on their device, which is usually a desktop PC, laptop, smartphone or tablet computer. What we don’t have here is racks of web servers as it’s a specialist operation. The data centres we use have large racks of computers stored in a temperature controlled room connected to the Internet through fast and reliable connections. We have a special reseller account with a major web hosting company so we can provide the best value web hosting for our clients. This has to be done securely, and the website should load quickly as Google and other search engines rank fast loading websites higher. It also includes domain email addresses and storage, distribution and management of messages. We can setup and install email accounts on all your devices, including mobiles. We can also provide those extra professional touches such as email signatures, auto-replies, out of office replies and forwarding addresses. Although we usually manage the web hosting for our clients we can provide Control Panel access so your internal web or IT personnel also have control over your website hosting and email accounts. Our web hosting is provided by a reseller account through a member of Hosting Europe Group, Heart Internet. Through them, we offer reliable, fast and secure hosting which can help you through every stage of your business from cheaper shared hosting for start-ups and small to medium sized businesses through to Virtual Private Servers, Dedicated servers and Co-location for high traffic, high-uptime websites such as companies with busy e-commerce operations or streaming music and video. We can help you decide on the best option for your business to make sure you get the best return on your investment and provide excellent technical support to keep your online business flourishing. These are the prices for our standard shared web hosting packages. This means that they are hosted on a web server with other web client sites (though you wouldn’t know it) but still offer excellent speed, security and uptime. We offer full recovery backup and restore from the last 30 days. To ask about or sign up for web hosting please fill out and submit the enquiry form. Enquire about web hosting.